It's not often I find "Z" names in the cemetery. Just in time for the challenge, I find two! Zilpha (aka Zilphy) was born about the year 1819, and joined the Missionary Baptist Church in 1840. Zilphy married Jerry Myre (Jeremiah?) Broxton and had several children. When she died in 1881, Zilphy left "one son, 5 daughters, 12 grand children and her dear husband." Our loved ones is Gone. And then there was Zollie. Born 20 April 1882 in Georgia, he was one of eight children born to Charlie and Ella Peavy. Zollie spent his younger years and early adulthood farming. He then married Julia Belle Ransom 26 February 1922 in Dooly County. She was about twenty years his junior, but I think the marriage was the first for them both. Zollie and Julia had at least four children before nephritis (inflammation of the kidneys) caused Zollie's death in the summer of 1930. The handwritten inscription on Zollie's simple gravestone, especially with the endearing moniker of Daddy, tugs at the heart a bit. And that's a wrap! This completes the A to Z Blog Challenge. A sincere "Thank-you!" to all that followed along. I am especially grateful to all that took the time to comment. I have discovered a few more blogs to follow through this challenge, so I plan to be talking with you again soon! Did you miss a post or two over the last month? 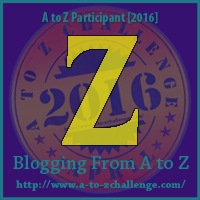 You can see all my A to Z Challenge posts here (in reverse order). I hope this is not the end of our relationship, and that you'll continue to follow this Southern Graves blog! So glad you found those two z names as I had been wondering how many were out there. Have really enjoyed reading your posts and glad I found your blog through this challenge. Lovely last post. Congratulations on a great job with the challenge! You rock. I've enjoyed your journey. Thanks for having me along. Well done, finding names for your last post. I love old grave markers - the best ones always seem to be found in the oldest cemeteries. Congratulations on completing the challenge!